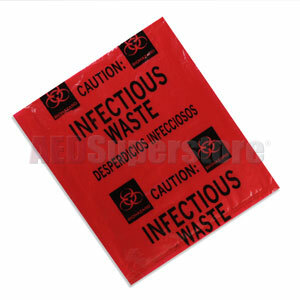 Biohazard Bag 10" x 12"
Biohazard Red Poly Bag - 2 mil, Size = 10" x 12"
Biohazard symbol and "Infectious Waste" caution message provide warnings to use extra care while handling and disposing contents. Meets current labeling requirements of OSHA standard 29CFR1910.1030 regarding biohazard symbols. Choose quantity above for discounts. I use these bags for the students on my School Bus. If the child (K - 12) feels sick, they ask for a red bag. This way they don't have yuck all over themselves and the bus. It is less embarrassing for the student and no clean up for me.